Well, I have been officially appointed as a member to the Agricultural Commission in the town of Barnstable. Today I am going down to the town hall to be sworn in. Our next meeting is tomorrow night. I am looking forward to it. I believe that we will be voting on the matter of roosters in the town of Barnstable. I feel a sense of self pride with this appointment. I hope to serve in my position well. This is a new chapter for me. My involvement in local town politics comes as a surprise to me. I am constantly reminded that life’s journey is full of surprises. This one is especially important for my flock. I hope to make both my human and feathered families proud. I attended the last Barnstable Agricultural Commission meeting in November 2010. When I was at the meeting, I was invited by one of the Commissioners to apply for a vacancy on the commission. At first, I thought that I could potentially be overwhelmed by adding one more thing to the ever growing list of my volunteer work. Then I thought it over for a while. 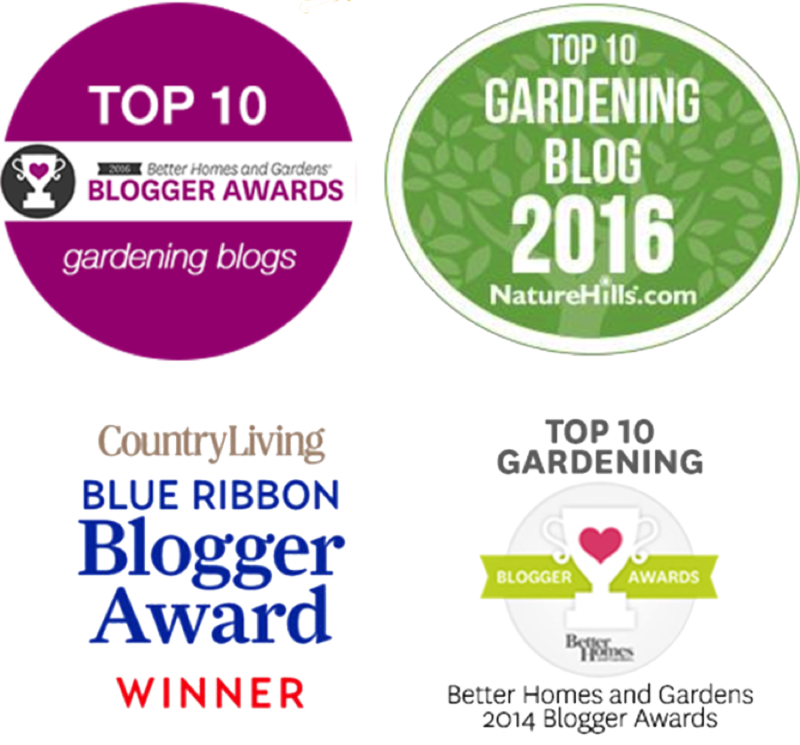 If voted in, I could help make a direct difference in how livestock, farming and gardening are represented in the Town of Barnstable. 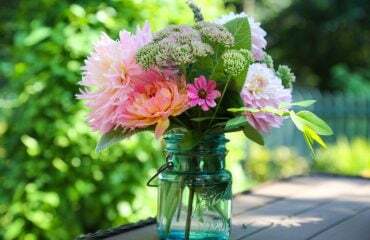 I could be beneficial and positive in many ways through bridging the gap between farmers and non-farmers, supporting Farmer’s Markets and community gardens while fostering relationship with various regulatory agencies in Barnstable. 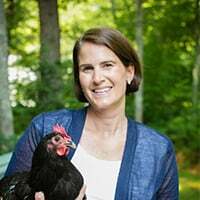 With my background, personal experiences, my career in medicine, volunteer work, gardening and raising backyard chickens I felt that I could be an asset to the the commission. I submitted my application for review. Over the past couple months, I have been going through the application process. Last week, I was interviewed by the Town of Barnstable Commission Board. I am pleased to announce that the board voted in favor and nominated me to the Town Council for final consideration. The long and short of it is, if all goes well, then I should be voted into the position by the beginning of February. So, wish me luck and send positive thoughts. I hope that bridging the gap with fairness-especially when it comes to keeping chickens-will keep their future bright. I was recently interviewed by a local paper about keeping roosters in Barnstable, MA. I felt that what I stated in the interview to the reporter was not clearly conveyed in the article. So, I wrote the editor a letter. I hope it will be published in this Friday’s paper. I’m crossing my fingers! I had the pleasure of being interviewed for an article by James Kinsella that was published on December 24, 2010 about roosters in the town of Barnstable. However, after reading the article, I felt that I was not represented entirely correctly. The closing line of the article said that I felt raising roosters “should not only be for the rich.” This quote was taken out of context and the remainder of what I discussed was not presented in the article. Initially, the draft form of the proposed rooster ordinance would require individuals keeping roosters to live on two acres or more of land. Through urban planning and zoning within the town of Barnstable, many people do not live on more than one acre. 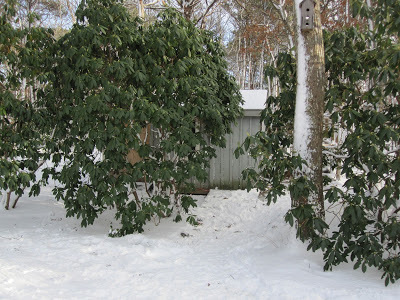 Affordable lots of land two acres or more in Barnstable are scarce. Thus because of the high cost of land in the town of Barnstable, it would, in my opinion make owning a rooster something that only the rich could afford. I also feel that keeping a rooster was made into a very black and white subject. In my opinion, it is a gray area. I believe that roosters can be a disturbance. 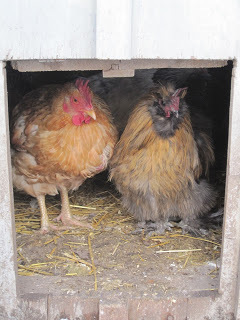 I also believe that if there are situations that cannot be remedied, then the rooster must be rehomed. Owning a noisy rooster requires the owner to be more responsible than just raising hens. The owner is responsible for controlling the noise of their animal if it is found to be an annoyance to those around them. Keeping roosters is not for everyone. We ended up with our rooster accidentally. Our she turned out to be a he. We did not discover this until he was 20 weeks old. We became attached to him. We quickly discovered he serves a purpose in the flock. He acts as a protector to the hens. He also enables us to raise chicks if we so desire. 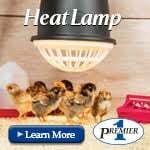 By hatching our own chickens, we avoid ordering chicks from out of state hatcheries and potentially introducing foreign diseases into our current flocks. It also keeps raising chickens local. 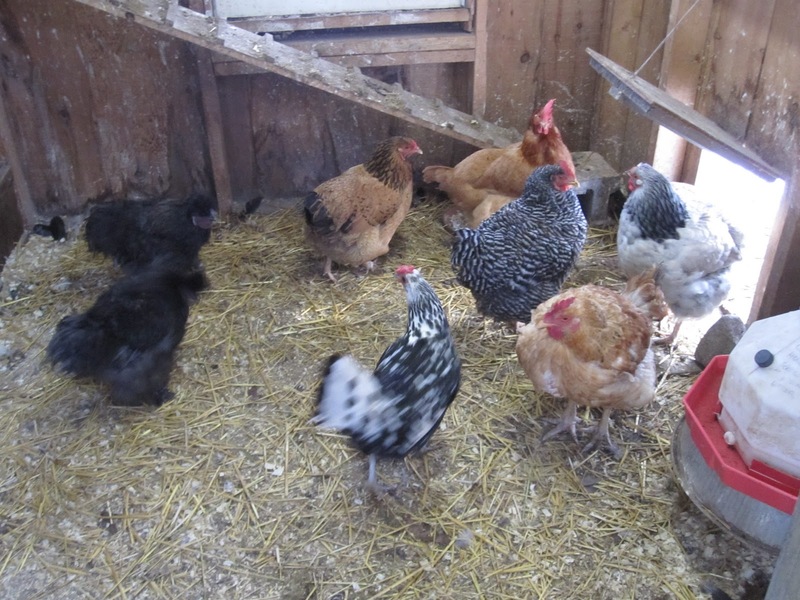 Through keeping hens and a rooster, my family has learned many valuable lessons. We have learned about the roles of the hens and the rooster. We’ve learned the lifecycle of the chicken. We have learned about the importance of knowing where food comes from. We are eating eggs from our local organically fed chickens. We have also learned lessons in responsibility and see our chickens as members of our family. 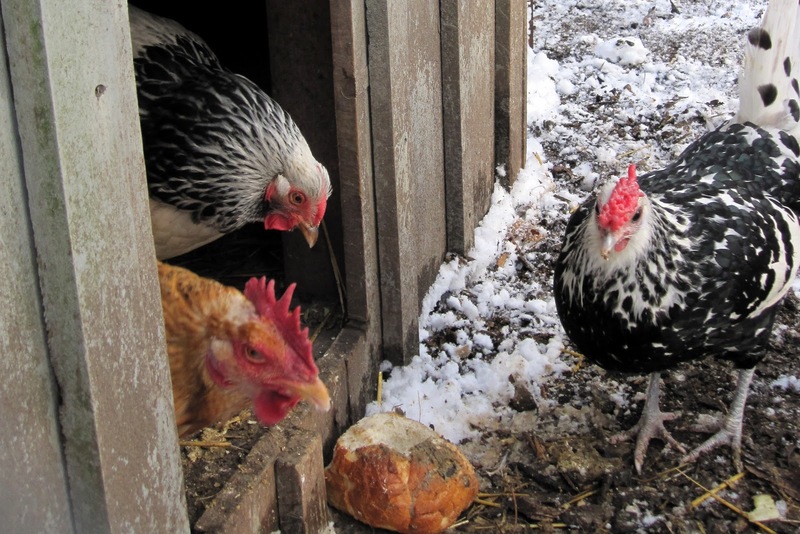 At first glance, you would never know that Viola and her family have chickens. 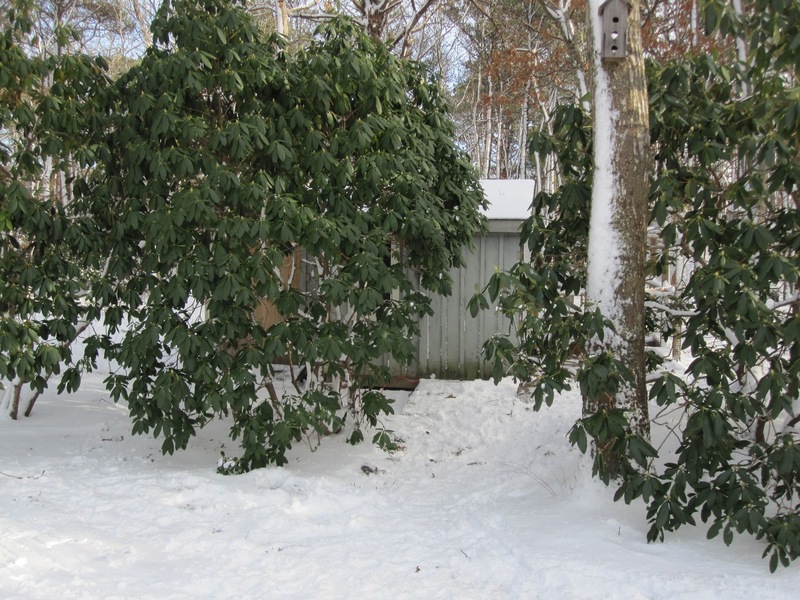 Tucked away behind some rather large rhododendrons is a large shed/coop and the chicken run. Viola has been raising chickens for seven years. Her first three chickens, 2 hens and a rooster, arrived to her when she lived in New Hampshire as a housewarming gift from a friend. 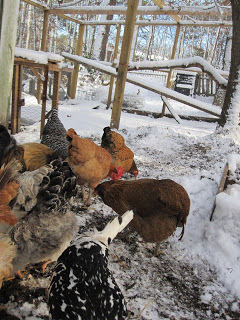 From there, her flock grew to about eight hens. Her flock moved with her to Cape Cod four years ago. They have now settled in Barnstable. 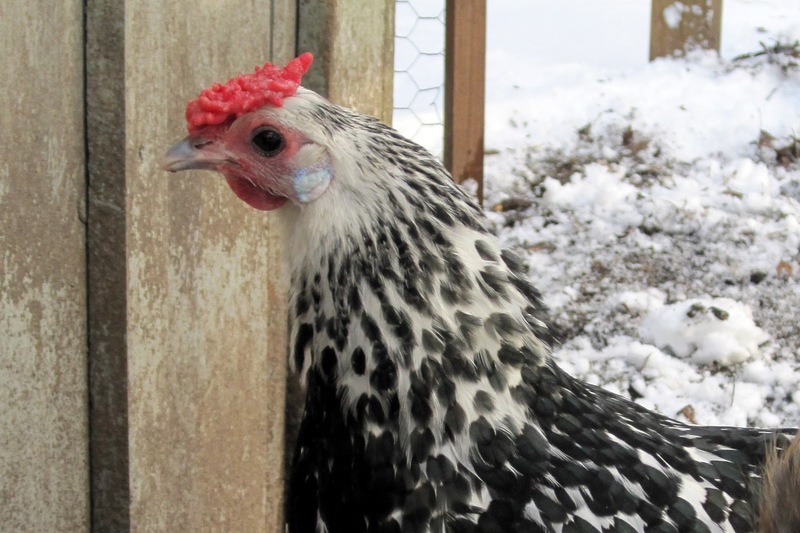 Viola’s current flock consists of a Hamburg, Silkie Bantams, a Buff Brahma/Araucana mix, an Araucana, a New Hampshire Red, a Barred Rock Plymouth, a Columbian Wyandotte and a Label Rouge. She currently has 10 hens and three roosters. A self-professed animal lover, Viola and her family always seem to adopt chickens that would have met unfortunate events if not for their interventions. Over time she has integrated many new additions into her current flock. Her son even saved a broiler hen that should have ended up on a dinner plate long ago. 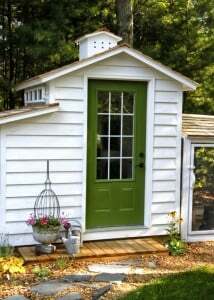 Viola’s current coop was created from using half of a storage shed. 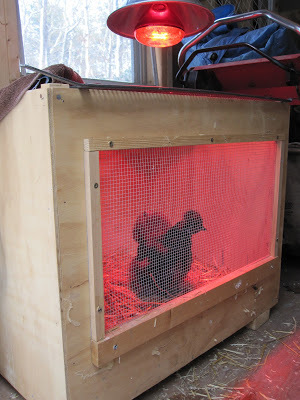 The coop itself is 8’x3′. The run is about 12’x 20′. 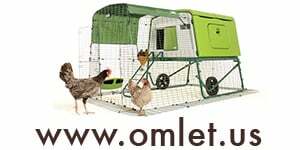 Viola uses the other side of the storage shed for lawn and garden storage, chicken supplies, her infirmary and brooder. 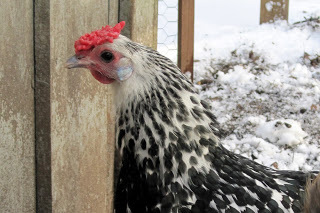 Due to various ages of her flock, in the winter she currently gets about a dozen eggs a week. She keeps roosters in her flock for a few purposes. The roosters can provide her with chicks in the future. 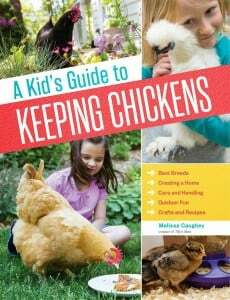 She also keeps them to educate her children about the biology of keeping chickens. However, most importantly, she just really likes roosters. Her flock’s favorite foods include oats, oatmeal, cream of wheat, tomatoes, lettuce, melon and cucumbers. She shared two of her top chicken tips with me. 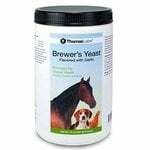 She suggests feeding items that you typically would compost to the chickens, bearing in mind the chicken’s dietary restrictions. She also suggests using flat inner tubes of bike tires as anti-slipping devices. Pieces of cut tire easily slip onto hooks used to hang feeders and waterers and prevent them from tilting askew. Viola has had only had one encounter with predators. She recalls that it happened when she lived in New Hampshire many years ago. A sneaky skunk pulled some young chicks through chicken wire. 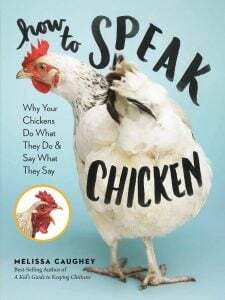 She also recollects having a rooster die from heat stroke. It’s been a long time since she put those original eight chickens on a moving truck to Cape Cod. As she speaks, her love for all things animal and chickens is evident. I am so glad that she let me interview her for my first post on my Cape Cod Tour de Coop. If you live on Cape Cod and would like to have your coop featured on my Tour de Coop series, please send me an email. I have become quite the advocate for roosters’ rights in the Town of Barnstable. As you know, I went to the Barnstable Agricultural Commission meeting a few weeks ago, and boy, have I been busy entertaining all sorts of questions. I have been contacted by both the Barnstable Patriot and the Barnstable Enterprise for interviews. I have also had the pleasure of meeting many people along the way that also have a love for roosters. I’m not quite sure how I got in the middle of this in the first place. I have been giving that question a lot of thought lately. I think that I have my answer now. Interestingly enough, before my life as a Cape Codder, a mother of two and a lover of all things chicken, I lived in a large city on the West Coast. I was in the fast paced world of academic medicine. I wore many hats as an educator, lecturer, professor, mentor, advocate and researcher in my field of nursing. As a little girl, I was always a nurturer. I was concerned when I saw people being bullied. I was awkward as a child and a move across town and then the country did not help. I was shy, quiet and an observer in life. In eighth grade, I got hit with a double whammy; large eighties style glasses and braces! I toed the line. I was never one for my parents to worry about. I was a good student and I stayed out of trouble. I was a child who always looked out for others and wanted so much to please my parents. Interestingly, I was drawn to nursing. I attended one of the top schools in the country and there I emerged from my shell. I owe my education much credit for the person that I metamorphosed into today. I became a strong voice, confident, articulate and able to advocate for the patients against the toughest meanest old-school physicians while caring for my patients. I was no longer shy or quiet. In fact, I was quite the opposite when it came to advocating for those patients who could not do it for themselves. I advocated for gang members, homeless, drug addicts, abused elderly and children. I was a voice for all and I was not afraid what anyone else would think. They were all that mattered in their times of need. Our move to be closer to family and seek a quieter slower paced life for our children, lead us to life on Cape Cod. I traded in nursing for motherhood and sat back, relaxed and began to enjoy watching my children grow. Chocolate, our rooster, is a huge part of our chicken family and we all adore him. I think that my nursing background kicked in when we were told that there was a possibility that we could not keep him. He did not have a voice. 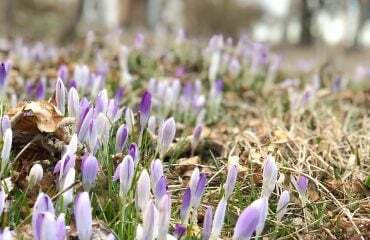 He could not go to the town and tell them that he was just doing what came natural. He needed a voice and I sprang to action. Here we are today, with another article slated to come out that I was just interviewed for last week. I answered so many basic questions that the reporter asked as he tried to grasp a basic understanding of chickens. I felt proud to speak on behalf of these amazing creatures. I am their voice. I am their advocate. I understand them and I hope to help others understand them too. I am so glad that I went to the meeting last night regarding the rooster regulations in the town of Barnstable. I was happy to see that seven other residents from town were there too, all in the defense of their roosters. Apparently, the rooster subject is not a new one. The Barnstable Agricultural Commission has been working on this for a while with one of our town council members. There have been some legitimate complaints about noise from roosters across town. However, there are no laws pertaining to roosters in town. Without an ordinance specifically for roosters, the town is unable to control some volatile situations that have arisen in neighborhoods. I felt like we came to this meeting just in time. 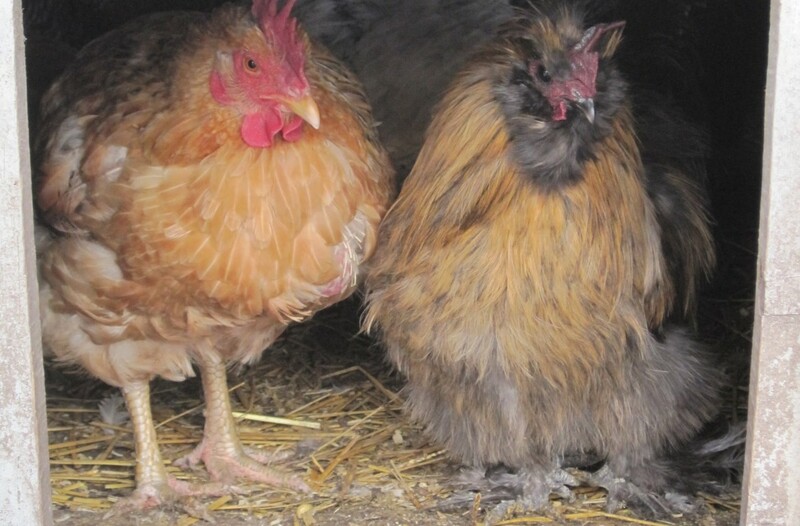 Last night, a town council member brought the draft of a rooster ordinance that was to be voted on and perhaps implemented at last night’s meeting. However, due to public comments and concerns, the ordinance as presented and drafted was edited and will be go back to the town and legal counsel for revision. 2. The rooster must be plainly audible from 150 feet or less from the complaint site. 3. There is a three strike fining component before there is any other action. The meeting lasted for two hours. After much contemplation and debate, the Barnstable Agricultural Commission decided on striking that 2 acres of land are required for a rooster. They also struck the wording “or less” and made it just 150 feet. They are also planning on clarifying what happens after you have had 3 strikes. So for now, the rooster ordinance draft, will go back to to the town’s legal counsel for rewording and reappear in a new form at the next Barnstable Agricultural Commission scheduled for January 2011. The most interesting twist of the evening came when the commission personally invited me to apply for the vacant seat on the commission. Isn’t it funny how life just sorts itself out? Last night I was definitely in the right place at the right time.